The most recognised feature of the Scottish Fold is the curled down ears, which gives it a beautiful round face. They are a friendly, gentle and sweet breed who like nothing more than being close to their human companions. 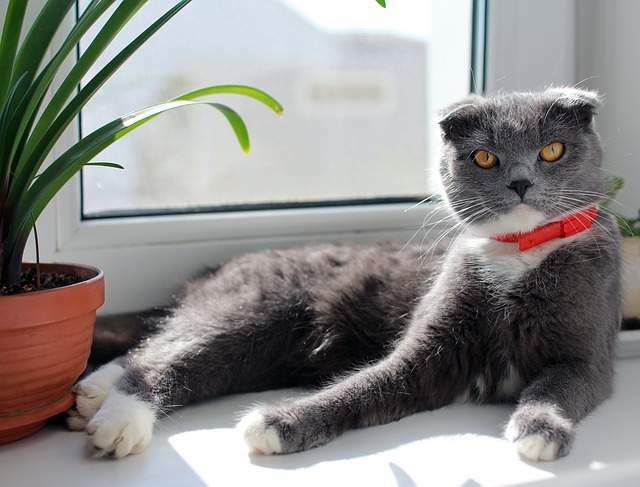 The Scottish Fold is a somewhat controversial breed of cat with many veterinarians calling for the breed to be banned due to concerns over the health of the breed. 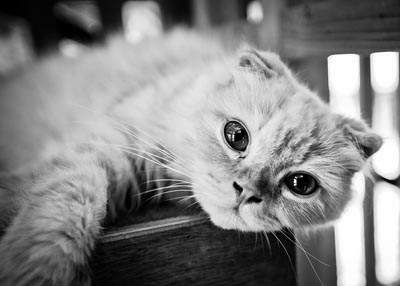 The first Scottish Fold appeared as a spontaneous mutation in 1961. Susie, a white kitten with folded down ears, was born on a farm near Coupar Angus in Scotland. A neighbouring farmer and cat enthusiast by the name of William Ross noticed Susie’s unusual ears which he pointed out to Susie’s owners, Mr and Mrs McRae. Two years later, Susie had a litter of kittens, producing two offspring with folded ears. William Ross received a white kitten called Snooks. Snooks was bred, producing more offspring; at this point, the new breed was called Lop Eared Cats. A London-based breeder by the name of Pat Turner visited the Ross’s, returning home with a male called Snowdrift. She began an experimental breeding programme with the breed. Patricia convinced the Ross’s to change the name to Fold. Three of Snowdrift’s descendants arrived in the United States in the early 1970s and the breed received championship status with the CFA in 1978. However, some registering bodies no longer/refuse to accept Scottish Folds due to the effects the fold gene has on the breed (see below). The ears are in the normal pricked position at birth but start to bend forward around four weeks of age. The gene responsible for the ears is known as the Fd which causes the cartilage of the ear to fold forwards. The Fd is a dominant gene with incomplete penetrance. Offspring only need one copy of the gene to inherit the trait. The heterozygous Scottish fold will have one copy of the Fd and one copy of the non-fd gene, i.e., Fdfd. Unfortunately, the gene responsible for the folded ears also has an impact on the skeletal system. Known as osteodystrophy or osteochondrodysplasia, this condition affects cartilage throughout the body including bone lesions, thickening of the tail, bones in the hind legs becoming thickened and arthritic, resulting in pain and discomfort. Scottish Folds should never be allowed to mate together as the offspring will be homozygous (i.e., have two sets of the Fd gene, making it double strength, so to speak). This results in debilitating skeletal deformities. Permitted outcrosses are the British Shorthair and American Shorthair. The head is well rounded with prominent cheekbones, the eyes are round and expressive, and the nose is short, wide with a slight nose break. The tighter the fold, the better. The body is medium in size and compact, legs are medium in length and heavy boned, and the paws are well rounded. 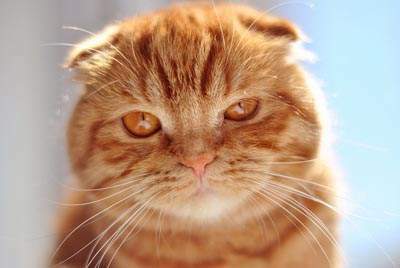 The coat of the Scottish Fold is short and dense and comes in most coat colours. 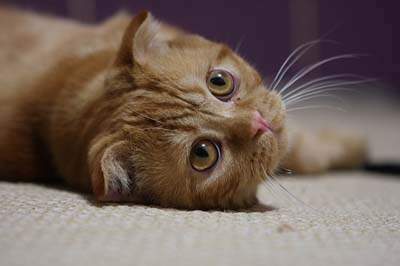 The Scottish Fold is a quiet breed of cat. They are affectionate, intelligent, quiet, sweet and loyal. Scottish Folds get on with people and other household animals and children. If you are out of the house for long periods, consider adopting two cats to keep each other company. The Scottish can be prone to arthritis in their middle to senior years due to osteodystrophy, a disease characterised by a thickening of the cartilage in the joints. The Scottish fold makes a great family pet as they get along with children, cats, and dogs.